AvatarSpirit.Net > The World of Avatar > Fan Art & Fan Comics (Moderator: Cerulean) > Inkwell's Avatar art! In this thread I'll post my dabblings in art. I'm not very good, but I do enjoy drawing occasionally. Critique and comments are very welcome! This was drawn with ink and a nib pen, completely free-hand and with no references (not even a pencil sketch, sigh). I did it as a spur-of-the-moment thing using only ink, and now I kind of wish I hadn't because it looks really wonky. The hands are horrible, I hate hands, they're incredibly difficult to draw. The arrow got kind of wonky because the blue ink was absorbed into the paper and reacted differently than the black ink, which surprised me. This is my first actual Avatar fanart, next time I'll use a reference. Drawing with ink is loads of fun and possibly my favourite medium, I recommend it to everyone! Nice! I love working in ink as well, there is something so spontaneous about it that lends to the freedom of line making. I look forward to other works you will post! Very good! You really nailed the head shape and the proportions are nice too. I'm kinda close minded when it comes to the tools I use to make art, I usually stick to different pencils. I really should branch out some more. I think I'm gonna try some more ink stuff now. I'm glad you like this picture And yes, I agree with you that there is some kind of spontaneity to the ink that makes it a lot of fun to use. A felt-tipped pen doesn't have that same playfulness to it, with ink you can play around a bit more with line thickness and such. 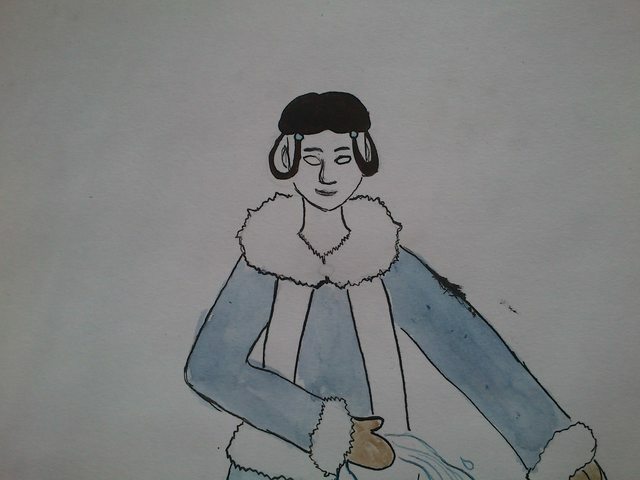 Here's Katara, I tried to draw her in a more realistic style. The image is not finished yet, I'm going to add details and then ink it. I did it in art class and didn't have time to finish it, will finish it next week maybe. 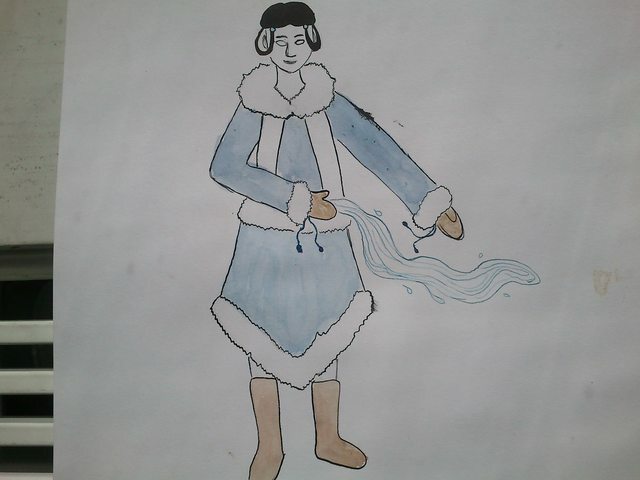 Water Tribe clothes are very difficult to draw. She's supposed to do some waterbending, hence the pose. Again, critiques and comments are more than welcome! ...knees and toes, knees and toes! Nice stuff here. I'd probably recommend some general figure drawing practice for getting anatomy down and for seeing a variety of poses in action. 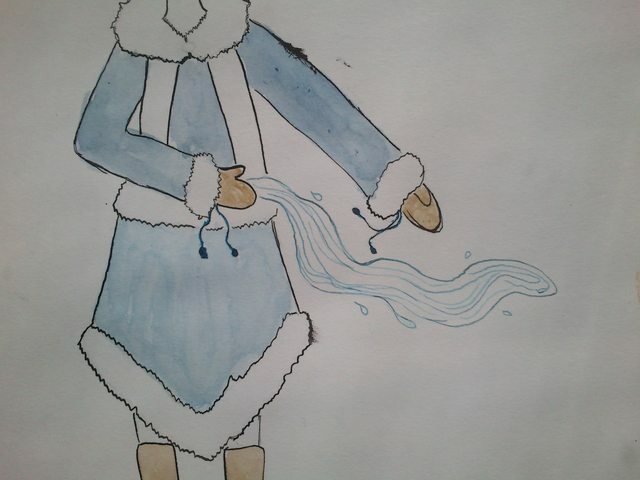 Also perhaps some more details on Katara's clothing? Little things like trims and stuff on coats can really look good. Yeah this is good! You have a really nice base to work with here. I think the face is the strongest part of this piece right now, but the details can make the drawing even better. Simple things like wrinkles, stripes, and fur on the clothes will make a big difference. I find sometimes it's easier to draw bending poses when you have a friend handy to pose like a dork for you too. I'm going to add more details to her clothes, the part I have most trouble with is how to draw a fur-trimmed hood on the jacket without it looking weird. I based the shoes on a picture of Iniut shoes I found, mainly because I couldn't find any good reference for them. 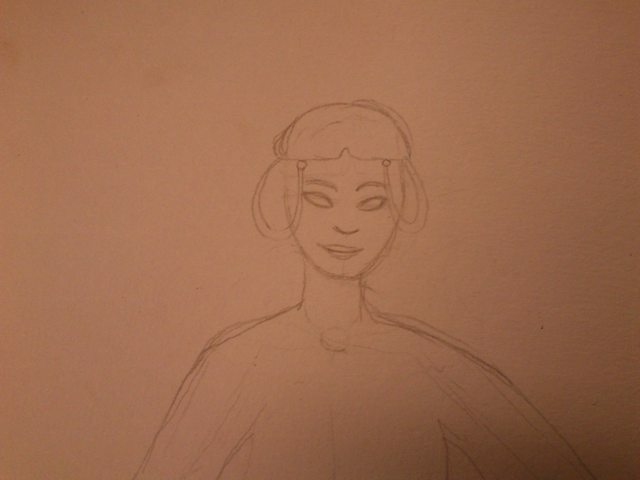 Can't wait to see the finished Katara. Are you just starting out/are these your first drawings that you've posted? I ask because I'm in an art class too (sort of). I'm just starting out, these are the first drawings I've posted here. The art class is an optional class in school. I like to draw but it's nothing serious for me, more like a hobby. I grew a liking for ink and nib pens when I was in middle school and used art to vent my feelings/escape from troubles in the real world; I can really recommend them for the sheer fun in drawing with them. You can play around and make weird things and have fun with the effects of ink diluted in water and such. Again, I'm so happy so many people have looked at the thread and written replies in it! Do you have a scanner? I imagine that will allow for a lot more leg-room when playing around with colouring and stuff. The figure on the left is based around that single line that curves through its centre, which right away gives it its sense of action and movement. I suggest trying different poses and lines like this to really bring your figures to life. Thank you! I do have a scanner, but my computer's broken at the moment (insert .gif of Bolin crying for my reaction when it broke) so sadly I cannot use it. I was planning to scan the Katara pencil drawing and colour and ink it digitally, but that seems quite impossible right now. Playing around with action lines and such seems a great idea, everything I draw looks so stiff and rigid all the time. I'm not super happy about it, something went wrong with her face. The skin tone is a bit off too, but after wasting literally three hours trying to get the perfect colour I threw caution to the wind and just picked a colour. It was fun to use watercolours, though, and fun as a sort of experiment. I'm sorry for the terrible quality, but I haven't got a scanner and the lighting in my dorm room isn't exactly great. 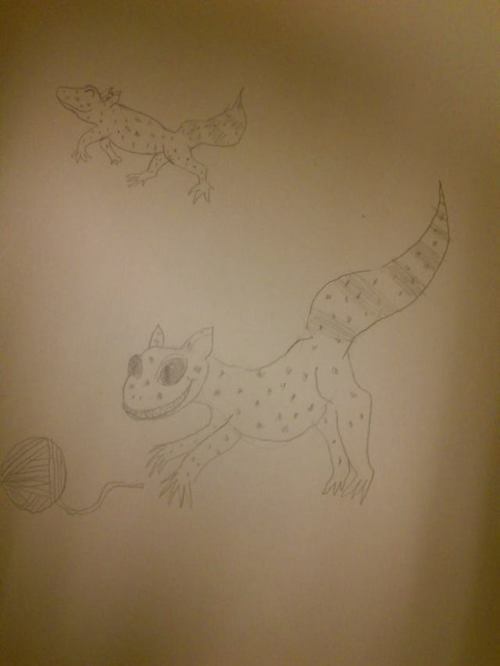 This is a geckat, an Avatarverse cross between a cat and a leopard gecko. They're roughly the size of a normal housecat, acts like a cat would and purr when petted. They live in the Fire Nation. I was thinking about drawing Mai with one, as she seems the type of person for such a pet. I'm not sure this is in the correct section as it isn't a canon Avatarverse creature but rather something I made up. If so, feel free to move this post (or I'll move it myself). Please give me requests for other animals to draw, this is a lot of fun!